Toward the middle of the second century, there came into the young Christian community a seeker for the truth, whose wide interests, noble spirit, and able mind, greatly enriched it. About 150, Justin moved to Rome. As philosophers did in those days, he started a school—in this case, a school of Christian philosophy—and accepted students. He also wrote. Three of his works are known to us: a dialogue in Platonic style with a Jew named Trypho, and two “apologies.” (An apology in this sense, of course, is not an excuse, but a spirited defense.) Justin’s First and Second Apologies defend Christianity against the Greek charge of irrationality and the Roman charge of disloyalty to the empire. These two works provide us with important insights into developing theological ideas and liturgical practices of early Christianity. In the Dialogue with Trypho, Justin defends the Church against the Jewish charge of distorting the Old Testament. He interprets the Old Testament as the foreshadowing of the New. While teaching in Rome, he engaged in a public debate with a philosopher of the Cynic school named Crescens, accusing him of ignorance and immorality. Angered, Crescens preferred legal charges against him. Justin and six of his students were arrested and brought before the prefect Rusticus. As the custom was, Rusticus gave them an opportunity to renounce their faith. All steadfastly refused to do so. Justin and his companions were put to death about the year 167. I Almighty and everlasting God, who didst ﬁnd thy martyr Justin wandering from teacher to teacher, seeking the true God, and didst reveal to him the sublime wisdom of thine eternal Word: Grant that all who seek thee, or a deeper knowledge of thee, may ﬁnd and be found by thee; through Jesus Christ our Lord, who liveth and reigneth with thee and the Holy Spirit, one God, for ever and ever. Amen. II Almighty and everlasting God, you found your martyr Justin wandering from teacher to teacher, seeking the true God, and you revealed to him the sublime wisdom of your eternal Word: Grant that all who seek you, or a deeper knowledge of you, may ﬁnd and be found by you; through Jesus Christ our Lord, who lives and reigns with you and the Holy Spirit, one God, for ever and ever. Amen. Paragrpah 2: attribution needed for the quotations. Are these from Justin or a biographer? Paragraph 3: surely the definition of ‘apology’ could be briefer. The Psalm appointed for today, according to this blog, is Psalm 15:5-11. Psalm 15 only has 7 verses. Could it be Psalm *16* vv. 5-11, as it was in Lesser Feasts and Fasts? Good guess! Psalm 16 it is! (I looked in the print edition of HWHM, and there is says 16:5-11) Glad you spotted that! Bio: He needs a ‘Who he is’ and ‘Why he is important’ statement. Why do we not celebrate “Justin and his companions”? After all, they were all martyrs. I think that’s an important point. It affirms that everyone in the church shares in risks of faithfulness, as well as the eschatological grace and calling of God. It’s not exactly “baptismal theology” but it certainly stops being complicit with the idea that there are STARS and there are generic nobodies in the church and that most of us baptized non-stars must therefore be generic nobodies to God and to the church! I hope something is made of this point! Thank you, Nigel. The names of Justin’s friends who were killed with him because they were professed Christians were: Chariton, Charites/Charito, Euelpistus, Hierax , Paeon, and Libernianus. Apparently all we know of them is their names. They are given in an unidentifed author’s work entitled: The Martyrdom of the Holy Martyrs Justin, Chariton, Charites, Paeon, and Liberianus, who suffered at Rome. In all there were six men and one woman. We are told a bit about where three were from or were living at the time. Justin stated he was living in Rome for the second time. Euelpistus stated his parents lived in Cappadocia. Hierax stated his parents were dead and was was forced to leave Iconium in Phyrgia. A summary sentence of scourging and then beheading was given even though some might have been Roman citizens. Is there a reason why the biography skirts around the place of birth of Justin Martyr? He was born at Flavia Neapolis now called Nablus on what is now the West Bank. 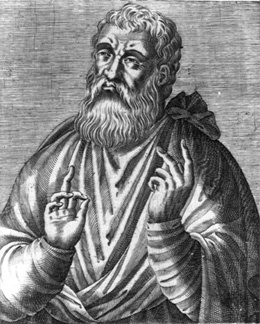 I think there should be a statement to the effect that what we know about Justin Martyr comes from his own writings. I think the day of his death is said to be April 13th but his feast day is a traditional one of June 1. Also, there is a “chatty” informality in the style of writing of Justin’s biography which is at odds with most of the other biographies which we have read this year in HWHM. Some extra words could well be removed which would improve the biography. TITLE: Nigel is exactly right that it should be Justin and Companions, Martyrs. NARRATIVE: I don’t always object to the “headline writer” pattern, but something about this opening paragraph strikes me as ridiculously formulaic, like “dark and stormy night” stories. There is nothing wrong with the second paragraph as an opening. If possible, kill the opening paragraph. >“All this knowledge” seems an odd and supercilious aspersion on the value of philosophical understanding. >Why the reference to Augustine? Does that helpfully elucidate “he was left restless”? > The whole paragraph is written in the past tense except for “he writes” – why change to present tense? > I would like to know where the Ephesus-beach-stranger-conversion story comes from, and whether to consider it factual or merely devotional legend. Paragraph 3: I appreciate inclusion of all the logical steps in telling a story, but there seem to be too many baby shuffles here. He moved to Rome and started a school for the study of Christian philosophy. We don’t need “philosophers in those days did thus and such,” he had students in his school, or that he could write. We might infer the last from the next two sentences, — about his, er, writings! The sentence about his two apologies makes clear what they are. (The preceding explanation sounds like an “the itsy bitsy spider” level of explanation.) The remainder of the paragraph reads well. Paragraph 4: I find this paragraph satisfactory, except that it ends abruptly. GENERAL: It’s probably a function of our sources, but there’s not a lot of “person” in this narrative. We have a thinker who accepted martyrdom rather than apostasy. If there is something about living his faith, over and above his heroic faithfulness and intellectual assimilation of the tradition, would be welcomed. How do we know about the deaths, or the “students”? Were they catechumens, already baptized, or what? They’re presented here as already resolute about religious faith, so it sounds like more than just one philosophy (or mythology) among others. Do we even know their names, or any details? Forced, direct martyrdom is both emotionally gripping and inspiring. This sounds like such a case. COLLECT: I can see the recourse to classical Platonic/Aristotelian attributes for the invocation in Justin’s case. Other, less cerebral, images are available [Foolish-Wisdom, Egypt-Promised Land (slave-free, wilderness-landed, nomad-kingdom), Exile&return, lost-found, others]. But, unmoved mover is very, er, moving. I don’t see any correlation between the invocation and Justin’s haphazard search, his providential epiphany, or the petition (seeking, finding, being found). There is no “so that” clause whatsoever i.e., no consequence arising for those praying, no resolve about living the baptismal covenant (the creed, the apostles’ teaching, etc.) just more asking of stuff from God – spiritual stuff, but all on God. It’s a dandy little summary, with yet another dig at his pre-Christian philosophical quest, followed by a wish list. It sounds devout, it’s just not much “qua” collect. Almighty and everlasting God, you found your martyr Justin wandering from teacher to teacher, seeking the true God, and you revealed to him the sublime wisdom of your eternal Word: Grant that all who seek you, or a deeper knowledge of you, may ﬁnd and be found by you; through Jesus Christ our Lord, who lives and reigns with you and the Holy Spirit, one God, for ever and ever. Amen. 7 I chose you, Israel, from my love, not your merits. 8 That, and the covenant, are why I rescued you from Egypt (Exodus). 9 Now hear this: YHWH – your God – loyal to covenant – 1000 generations! But two verses prior (verse 5) Israel is told to get physical with rival religions. Nothing in the HWHM narrative says Justin’s style was to get physical. We need a passage where our use of it doesn’t distort or reverse its canonical message in context. 5 But this is how you must deal with them: break down their altars, smash their pillars, hew down their sacred poles, and burn their idols with fire. The Psalm (16:5-11) would be fine if it followed an OT lesson that matched its more affirming, eschatological sense of God’s bounty for His people (“11 You will show me the path of life; *in your presence there is fullness of joy, and in your right hand are pleasures for evermore.”) Deuteronomy 7:7-9 can’t be it, hiding its violent contextual imperative, the way it does. A wisdom passage with the message, “follow God’s wisdom and be blessed by doing so” shouldn’t be hard to find instead. The epistle is a brilliant selection for the commemoration of Justin. Great choice there! The same goes for the gospel, which even includes an eschatological strain, 48b (on the last day the word that I have spoken will serve as judge”). There is judgment, but it is on the last day, and it is God’s. That’s a lot different from Deuteronomy’s premise. PREFACE: The preface works, especially, “confessing before the rulers of this world the great Name of your only Son”. PS – On “all this knowledge,” — the unspoken innuendo seems to me to be “all this [useless] knowledge.” Who is to say it’s useless? Maybe his earnest pursuit of meaning prepared him to recognize the value and truth of Christ when the time came. That would make it far from useless knowledge. Also, not only the resulting KNOWLEDGE is involved. The process of pursuing it, engaging seriously, evaluating it, developing discernment and shaping his character in such a way that he continued in pursuing specifically CHRISTIAN philosophy, were all part of his calling as a Christian. The fact that he didn’t start the race at the finish line shouldn’t be ridiculed, either overtly or implicitly. There’s nothing wrong with commemorating Justin alone and much right with it. His martyrdom is remembered because he was a philosopher, not because he was a martyr. He only keeps that designation because its a convenient and traditional way to refer to him — back from the “bad old days” when titles like “virgin” and “martyr” were the big names, not “prophetic witness” or “holy pillow fluffer”. That’s not unheard of in Eusebius’ writings: consider the names of Blandina et al — anyone with some Latin will recognize that they are fill-ins, something like Luke’s theophilus. As to your question about Roman philosophy — what Roman philosophy exactly would you identify in Justin’s theology? It all seems quite Greek to me! 😛 There just wasn’t much (any?) meaningful Roman metaphysical philosophy, which was the primary philosophical sphere of Christian debate for the patristic period. I wouldn’t change the invocation in the collect — Justin was one of the first to flesh out the true meaning of those terms — and it avoids HWHM’s fatal flaw of being too cute for its own good. The middle of the collect seems a little too pleased with its own parallelism though and doesn’t read well — in your face parallelism makes for great prayers but only when the syllable count is more even. (I.e., “Grant that all who seek thee, or a deeper knowledge of thee, may ﬁnd and be found by thee” is too much of an “Let A or B do C or D so that E or F may happen to G or H” structure — one needs a binary search just to parse the implicit tree! Feel free to ignore that anyone who doesn’t program…it’s quite nerdy) I think the best way to improve the balance is to drop “or a deeper knowledge of thee” — I think we all quite comfortably still fit in the seeking category. As to “all this knowledge” — I don’t think the problem is in an implied “useless” (which I don’t hear) but rather in identifying the philosophical training which leads to metaphysical questioning as “knowledge” — it’s not really anything of that sort. Perhaps, ” Like Augustine after him, he was left dissatisfied by the Greek philosophical systems of his day.”? On the one hand, I can see the value of including with Justin his companions in martyrdom. On the other hand, the real reason Justin is a commemoration of long standing is not because he was a martyr (although that is important and significant) but because he was one of the first theologians to bring formal philosophical training to the proclamation of the Gospel. His Apologies and the Dialogue are important documents in early patristics. We would commemorate him even if he had lived to a ripe old age. I agree with the comments on the style of the bio. It sounds like a rector who’s not very good at that sort of thing trying to do a children’s sermon.